A March 2, 2012 update, for this post is available, [click here], and it refers back here. Google alert is an interesting tool. If a word search is done on your name you can be alerted. Elected and other officials can have staffers monitor their google alerts. Say something negative about an official and your name can be put on a list to be taken down. Contacting an elected, or other official by email, by phone, by letter, or in person, you can be added to the list. Speak at a public hearing, your name can be put on the list. What happens to people on the list? Well, look at White Supremest racist radio host Hal Turner. Turner started talking about the alleged private, homosexual lives of two former State of Connecticut Judiciary Committee Legislators Michael P. Lawlor and Andrew J. McDonald and an alleged Judge Mafia in Connecticut. Turner was an alleged paid informant for the FBI who was paid tax dollars to incite citizens to commit illegal acts for political purposes. 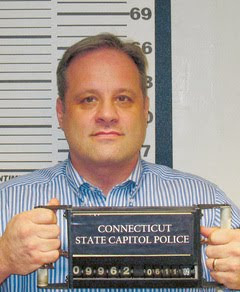 The real story of how Hal Turner ended up arrested by the Connecticut State Police Capitol Guards should be an interesting story. That is if the real story is told. [click here] for post to go with below picture, in post called, "The Hal Turner Diaries"
There is no relation between Hal Turner and Michael Nowacki, none. Except on how each is investigated and being set up for a fall. Connecticut State Police have a special investigations unit. The Connecticut courts have a Judicial Marshal service which are allegedly their version of spy goons who either go out and terrorize citizens, or who hire "cut outs". There is a union in common for taxpayer paid officials, police officers, and those who work for the judicial branch. There is an alleged connection between the judicial branch manager and the Commissioner of the Connecticut State Police. A Freedom of Information request to see who is investigating, what money is being spent, who is being employed and the tactics being used. Word searches can be manipulated. Citizens' computers can be hacked into officially. Communications are captured, and others who are part of a target's circle are also put under surveillance. Weaknesses are looked for. A target is then set up for an arrest. Police informants are to keep track of any drug or alcohol use of a target. A target can be attacked by a police informant and only the target with face prison after the arrest. Mental Health authorities are also called into play. If a target is to be evaluated, the target can be put on drugs to make him, or her, appear crazy. Whistleblower Anne Kristine Blake was set up the Manchester Connecticut Police, the DMR Department of Mental Retardation, the Connecticut Court System, and doctors working to put her into a mental hospital. A stamped passport proving Blake was out of the country when police knowingly took false statements to take down Blake was foiled the retaliation plan. [That story with documents]. Putting "Michael Nowacki" of New Canaan Connecticut in a Google word search for a time, [this was the number one result] a post on my main blog with Mike's picture and link to his website. The post disappeared almost entirely from word search results. When there is manipulation of the results an argument can be made that there is something nefarious going on behind the scenes. I had gone to Connecticut State Senator John A. Kissel about removing Rockville Judge Jonathan J. Kaplan and how Connecticut State Police Officers were harassing me over having proposed Civilian Oversight of Police legislation saying I was kicked out of Connecticut and would be arrested if I didn't shut up and leave Connecticut. John allegedly called the Connecticut State Police telling them I had contacted him and the harassment only worsened. Blog posts on Kissel and Connecticut State Colonel Thomas "The Duck" Davoren were removed from word searches with key words indicating public corruption and police misconduct. Kissel was aware that I was railroaded to prison, and was key as part of the Judiciary Committee in keeping Kaplan on as a judge even though I was sentenced by Kaplan to a year in prison for resisting being mugged on my property for retaliation for trying to have him removed and for lodging complaints against the Connecticut State Police. Michael Nowacki has been vocal about New Canaan police misconduct, has lodged complaints against a Connecticut Judge, and has contacted legislators. So, I would assume if a Freedom Information Act is conducted to find out who is paid with tax dollars to spy on Nowacki electronically and how police informants are being used, an interesting story might come out. Nowacki's arrest was probably preplanned for political reasons. Newspaper hierarchy and those in television and other news organizations meet directly with Connecticut Supreme Court Justice Chase T. Rogers and other judges to decide what can be reported in the media. So, news out of the mainstream is what the powers in a State allow to be published or to go over the airwaves. Nowacki is allegedly supposed to be painted as a nut, so there is not public sympathy for his plight, or anger over how he has been targeted. Chris Kennedy did months, if not years of legal research. He'd spend 6 months, or so, writing a motion. A judge in Connecticut would just deny the motion, unread. Does this sound like justice in America? Chris Kennedy was then placed on the Connecticut State Police Secret Enemies List and then arrested. I was put on the same list for blogging and for being associated with Chris Kennedy. Do you want a system of policing, a court system, and government that is a corporate version of the abuse that was the former USSR? Connecticut State Police told me I was going to get a "hot shot" in prison and I would die, or suffer some horrible disease. At the time the officers were threatening me with this, I was not suspected of any crime, was not on probation, and hadn't been arrested for anything. Officers knew I was to be arrested, that I was to go to prison for whatever offense I was arrested for, they knew the outcome of a trial before it was held. Does this sound like an "American Justice System"? Nowacki's case is unfolding in real time. What police state abuse that is occurring behind the scenes should be looked into. 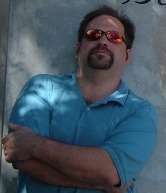 [click here] for post to go with Michael Nowacki photo, post called "Profiled for contacting elected officials?" The Steven G. Erickson mugshot can be found in [this post].